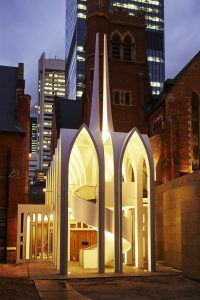 In 2017, the Cadogan Song School at St George’s Cathedral in Perth was celebrated for its ‘outstanding contribution to the quality of concrete in Australia’ at the biennial Concrete Institute of Australia’s Awards for Excellence. In recognition of its splendour, the project won the prestigious Kevin Kavanagh Trophy—the highest honour that can be awarded to a concrete project. Here, the project was also awarded the 2017 WA State Award of Excellence in the category of Commercial Buildings. Fast forward to 2018, and the Cadogan Song School’s eminence continues to soar. At the Australian Institute of Architect’s 2018 WA Architecture Awards, the project received the Margaret Pitt Morison Award for Heritage and the Julius Elischer Award for Interior Architecture. As well, it earned an award in the Public Architecture category and a Commendation in the Mondoluche Lighting award category. The project also won the Best Public Use Building ($1,500,000 – $5,000,000) award at the 2018 Master Builders Excellence in Construction Awards. The beauty of the Cadogan Song School lies not only in its elegant design, but also in its ability to resolve the connection between three significant, yet individual, heritage buildings. Set between the celebrated 1917 Burt Memorial Hall, the 1888 Cathedral, and the 1859 Deanery, the Cadogan Song School is a stunning two-storey precast concrete structure that isn’t just a treat for the ears. 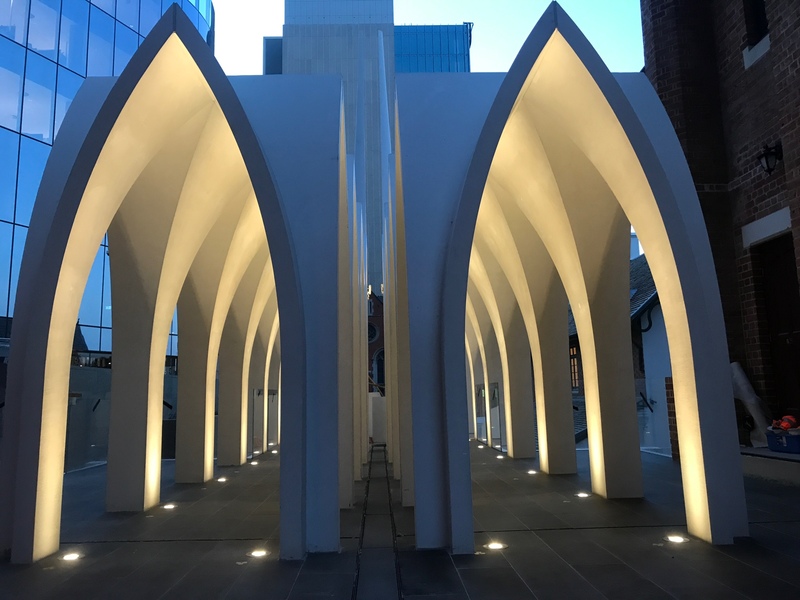 Featuring a striking white façade, two tuning fork spires, and lancet-inspired arches, the $4.8 million development is also music for the eyes. Designed by Palassis Architects, the Cadogan Song School needed to seamlessly fuse with the surrounding 140-year-old architecture and maintain existing sight lines for the Ascalon sculpture in the forecourt. 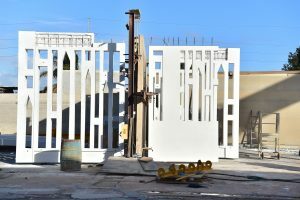 To achieve this vision, Adelaide-based company, SA Precast, was contracted to manufacture a varied collection of white precast concrete elements for the project. These included curved beams for the rehearsal room, two precast concrete spires, three lattice feature wall panels, the first storey supporting columns for the second storey shells and the shells for the second storey that form the colonnade. 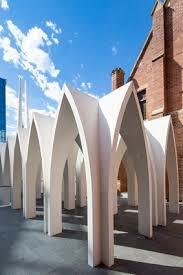 The elements were manufactured with a white cement and featured a lightly textured off-form finish. The array of white elements creates an almost ethereal landscape and showcases the ability of prefabricated architectural precast to achieve what is a splendid vision that has been imagined by the architect. National Precast’s Chief Executive Officer, Sarah Bachmann, believes the achievements are a testament to the quality of precast concrete that the organisation’s members produce. “Specialty Architectural Precast – known as SA Precast – are one of Australia’s leading architectural precasters, and we are delighted they have won these awards as recognition of their outstanding achievement for the Song School project,” Ms Bachmann says.